Shoulders are one of the most overlooked muscle groups when it comes to overall aesthetics. Everyone wants big arms, a big chest, and a rippling 6 pack. But what about shoulders? When you walk on stage as a competitor or into the gym your shoulder width and V-taper will attract admiration. Aesthetic bodybuilders have wide shoulders and small waists: Arnold Schwarzenegger, Frank Zane and current Physique Mr.. Olympia Mark Anthony are known for their V-taper. But what do you do when you’re not blessed with this kind of V-taper like myself? Well, you have to create the Illusion by building up your shoulders. Focusing on shoulder exercises like Side Laterals and Rear delts will help develop this width. 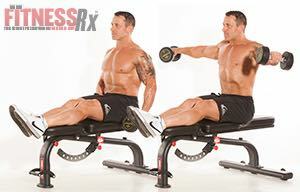 Movements that develop overall mass and strength such as military press, overhead press, seated dumbbell presses should be your foundation, but incorporating Arnold presses, front raises, up-right rows and bent over rear delt raises should be the primary focus, as the front of your shoulders will likely see much of its over development from other pressing movements that are incorporated in your chest exercises. The often over-looked portion of an effective shoulder workout is the isolation movements that develop the Front, Rear and Side delts. Isolating the side delt will add width to your frame. Working the rear delts will add size to your back and ensure that your shoulder doesn’t drop off at the back. I have included the following 5 exercises and my current shoulder routine that I have be concentrating on to bring up my shoulders and create a better V-taper for this years Canadian national physique competition. The compound movement that requires the most energy goes first. Arnold Schwarzenegger found that by turning his hands in and out in the shoulder press motion he was able to hit his front delt more. For more shoulder annihilation don’t lock out at the top. This will keep the shoulder under tension throughout the movement. I perform 8 sets x 10-12 reps with 60 sec rest between sets and also adding 2 drop-sets on set 7 & 8. I perform 10 reps with 70lbs, and then drop down to 40lbs for another 10 reps.
Too many people do lateral raises with dumbbells and heave them into the air with momentum. The goal is to isolate the side delt not to throw weight around. Lower the weight, take a seat, and put your feet on the bench. Lift from your elbows and make an effort to keep your arms locked in the same position and float your arms horizontal to the ground. Hold, lower, repeat. Staying seated enables proper form. Bend over from the waist. Keep your core tight and chest out. Lift from your elbows and flare your arms out to the side. Make an effort to bring your shoulder blades closer together in the upward motion of the exercise. This is going to target those often-neglected rear delts. Having rear delts that POP give your back respectable presence. The seated Arnold Press gave us the mass, the Side Lateral Raises target the side delts for width, the Seated Rear DB Flyes give us the rounded shoulder at the back and we can’t forget to isolate the front delts with plate raises. Grab the 45lb plate and keep your core tight. Keep your arms locked and float the plate in front of you until it’s horizontal with the ground. I perform 4 sets x 12 reps of Front plate raise with a pause at top, immediately followed by 12 reps of up-right rows using the same 45lbs plate. Only 30 sec Rest between sets! Burn it out.